Prime Minister Voreqe Bainimarama has reported that more Fijians have registered for the 2014 general elections. He told Melanesian leaders gathered at the 19th MSG Leaders Summit yesterday that 80 per cent of the Fijian population have registered. “More than 80 per cent of the estimated number of eligible voters, which equates to over half a million Fijians, have registered for the elections,” PM Bainimarama said. PM Bainimarama said preparatory work for the country’s elections was well underway which will be on the basis of one person, one vote, one value instead of the racially weighted method employed until recently. 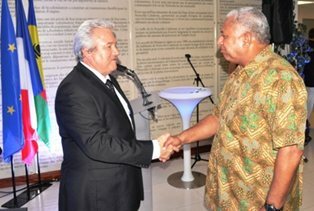 “Fiji would hold for the first time in its history a truly democratic parliamentary elections by September 2014,” he said. Phase three of the Electronic Voter Registration for next year’s elections began in June and will be completed by the end of the month. PM Bainimarama acknowledged the support of foreign countries that have contributed towards Fiji’s election process.